While we all rely on law enforcement to keep us safe and protect us, it is important to know your right during encounters with officers. Throughout the Central Coast and the nation, people have demonstrated against prejudice and police violence. People of color have found themselves stopped and questioned, suspected of being undocumented immigrants or potential terrorists. Young people near Cal Poly complain they are stopped just for being college age. 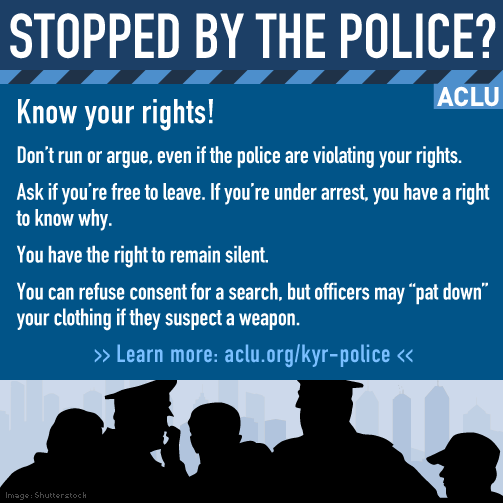 Find out how you can legally protect yourself when law enforcement stops you or your friends. The ACLU Chapter of San Luis Obispo County invites you to attend a free “Know Your Rights” event this Sunday at the library on the corner of Palm and Osos streets in San Luis Obispo, from 7 p.m. to 8 p.m. Complimentary refreshments will be provided. I think that this issue has many dimensions, all of which can lead to different conclusions. For instance, the public ought to realize that policing is a tough profession, and law enforcement deserves the help of good citizens. It is also true that those police professionals are working on the taxpayer dime, and respect needs to go both ways. Luckily, most cops act with respect and professionalism, and most citizens acknowledge the difficult job that cops face everyday. Let’s continue to teach people their rights AND responsibilities under the law, and demand law enforcement stress ‘serving’ the communities they represent. Just wait till you get your turn and you’ll know what I’m talking about. In addition to being polite, losing any signs of aggression and showing some respect for authority, I would also suggest that you not “volunteer” any additional information to an officer of the law. For instance, an officer pulls you over while driving, comes to your window and asks you: “Do you know why I pulled you over?” NEVER offer any potential reason(s); it is entirely possible that you might point out something wrong that the officer hadn’t noticed, but now has an additional reason to give you a ticket. An officer asks you: “How fast were you going?” Again, don’t offer up anything other than an “I’m not really sure, noticing you in my mirror I didn’t want to be distracted by looking down at my speedometer.” or something similar; if you offer a number, you might be admitting to speeding, or if you offer a number lower then you were going, you could get in trouble for “lying to a peace officer”, not a good idea. And never consent to a search of your vehicle, period. As shameful as it is – the actions you take and the actions taken by the officer are highly dependent on the color of your skin. This is not right, but it is a fact. Copperhead “beating”…is that professional and legal?Nope. Just as I said…Bullies with Badges. If you live here long enough, you will find out what they are really like. And once they harass you, they won’t leave you alone. They call it the “municipal shuffle”. They bring in the worst cops from other cities and hire them. Hired thugs. It’s pretty easy, say yes sir, no sir, what did I do wrong sir, and if it escalates further shut your mouth, put your hands where they tell you and then call a lawyer. Guaranteed not to get a beating and likely not get a ticket. I have an honest question for you: do you believe the officer should refer to the suspect as sir at all times as well?